Accompanying the limited edition series pens in Montegrappa’s popular Cult Collection are matching accessories that expand on the theme. The series honours individuals, artists and elements of popular culture, and one of the most exciting has been the family of writing instruments commemorating those swashbuckling adventurers who terrorised those who traversed the Caribbean during the 16th through to the 19th centuries: Pirates. 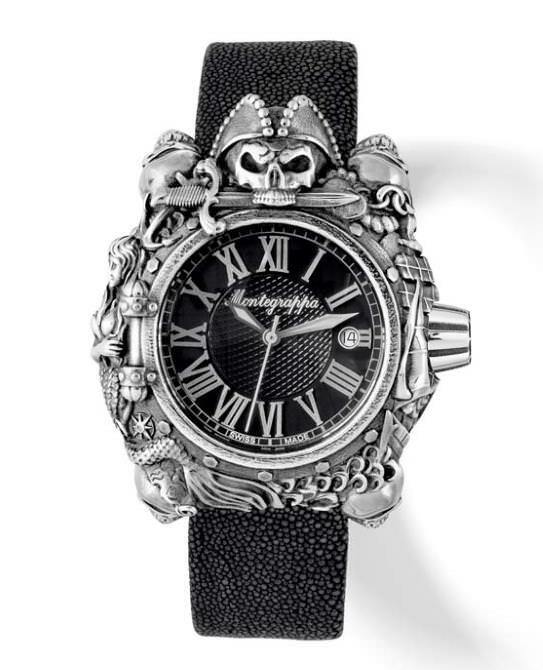 Montegrappa is pleased to announce the release of a wristwatch to accompany the Pirates Pens. Immortalised by writers including Robert Louis Stevenson and Rafael Sabatini, the pirate is one of villainy’s most appealing characters. Heroic or likeable pirates have been exemplified on-screen by movie stars. While certainly ranked as outlaws, their wanderlust, independence and rebelliousness have created a romantic, near mythical age. Their look has inspired popular performers, defining the style of Adam Ant in the 1970s and the Rolling Stones’ Keith Richards, long before he portrayed a pirate on-screen. And while piracy remains a real-life concern in the 21st century, there is no doubt that the historical and fictional buccaneer will forever fascinate lovers of adventure. To complement the Pirates writing instruments collection, the Pirates wristwatch is embellished with precious metal overlays that reproduce the motifs of buccaneer culture in intricate detail. The die-cast 43 mm case is finished either in burnished Sterling Silver or in Sterling Silver with Vermeil yellow gold accents. It captures the eye, revealing its secrets slowly, for every surface is festooned with piratical elements. At the top, the grinning skull known as the Jolly Roger holds a dagger in his teeth, a small skull sits at each corner, in-between are heavy marine ropes, swords, chains, mermaids, sails and other images and items associated with pirates, while the crown bears the pattern of the ship’s wheel. Inside the massive case is one of the world’s most dependable automatic movements, the renowned ETA 2824 automatic calibre. The case is secured by four screws and features a screw-down crown, to protect it against water ingress up to 10 ATM. Fitted with a genuine stingray leather strap, the Pirates timepiece will be issued in a limited series of only 88 items in burnished Sterling Silver and 88 in Sterling Silver with Vermeil accents.